Literary journal Sport has returned for its 46th instalment, featuring a great variety of fictional pieces by 49 New Zealand writers. It’s a little difficult to know how to properly review Sport 46 as a book when it covers so many styles and formats. Each essay, poem, story and interview really needs to be considered in its own review. There are some very distinctive voices here, and each one demands your full attention; despite this, they feel perfectly at home alongside eachother. The anthology opens with a interview with Bill Manhire by Anna Smaill, and from there covers an impressive range of fiction. Amongst the more traditional stories and poetry, seven essays fit in seamlessly, as does Barry Linton’s brightly coloured comic, My Ten Guitars. This is a story told through a list of the guitars that have followed the author through his life; from Hamilton to Auckland, from his first guitar at 16 to his friend’s Yahama guitar before it got stolen. The list of guitars survived by the author tell an autobiographical story in such a refreshing way; it would be wonderful to see more comics in future editions of Sport, as they are such an effective yet underrated storytelling medium. While I love a good poem – and Sport 46 certainly has no shortage of very good poems – short stories are always the pieces I tend to enjoy most in an anthology. Amongst my favourite pieces in Sport 46 is The Pests, a short story by Zoe Higgins. A teenager who builds landscape models discovers that her perfect miniature worlds are being invaded by mysterious creatures. Another short story that particularly captured my attention was Blue Horse Overdrive by Anthony Lapwood. A group of young friends experience a number of startling things in a short amount of time; their band is noticed by a record company, the bass player begins routinely fainting while perfoming, and most concerningly, the band begin to see an electric blue horse appearing in the crowds during their gigs. The supernatural elements of both of these stories make them so enthralling to read; I thoroughly enjoyed them. I strongly recommend that you get your hands on a copy of Sport 46 and sample some of the best work to come from New Zealand writers in 2018. There is an excellent combination here of the bizarre and the familiar, the distortion of a dream and the comfort of home. We find out in the first few minutes of this session, knowingly chaired by Fergus Barrowman, that Flying Nun was the first foray for Alex Ross, music critic for The New Yorker, into popular music. This writer, who so wonderfully filters twentieth-century history – wars, technology, social changes – through classical compositions in his widely accessible The Rest is Noise, has just risen in esteem – at least among those members of the audience who are familiar with Flying Nun. You get the feeling that this crowd is more in touch with Sibelius than Chris Knox. Up until this point in college only dissonance had been admissible to Alex, but ‘the lyrical and melodic’ elements of bands like The Bats and The Clean, with their ‘sweetness and straightforward nature’, encouraged him to discover popular music. Working at a student radio station, he also began listening to punk and jazz – the beginnings, perhaps, of his book Listen to This, which reveals the boundaries between pop, jazz and classical to be porous. Does he wish to remove borders between musical genres altogether? Alex believes that borders exist for a reason; that every music has its centre, but sometimes elements that lay on the outskirts may easily cross over into another. We might think of classical music as static and unchanging, but it too alters as it moves through time. But then how do you bring, for example, improvisational openness to academic music? Some of the more interesting musicians, the ones to watch in Alex’s opinion, are the ones who easily move between genres – jazz and classical for example – as if they had grown up in both worlds or occupy the middle ground. But improvisation is something classical musicians need to get a handle on, as the newer compositions require more input and invention on the part of the performer. And what of the condition of classical music in the public sphere? Audiences are often blamed for not attending classical concerts with new programming, but, as Fergus points out, this is essentially inviting them along to listen to new music. Alex concedes it is hard to find the balance between old and new. It was also a balance he was seeking in writing The Rest is Noise, where he tried to appeal both to the obsessive specialist and the lay reader, and where he consciously attempted not to take sides with either the avant-garde, Stravinsky, Schoenberg and atonality on the one hand, and then Sibelius and co on the other. He ‘wanted all these composers to be taken seriously as heroes of the modern’. Alex uses episodes in The Rest is Noise with great skill to draw attention to wider movements or tendencies. One such event opens the book – the world premiere of Strauss’s Salome. Everyone gathers, expectant, wishing to be part of the sensation. Could this happen again, Fergus asks? No, for as Alex explains, these composers where huge cultural figures of their times – he tells us that The New York Times ran ‘Puccini’s boat stuck in fog’ as a front-page headline. The issue of classical music’s reach flows through to questions from the audience. How do you attract younger and more diverse audiences to it, when it is perceived as elite? Alex takes issue with the elite angle – as classical is often compared to pop, which is elite in the systems surrounding it: it makes use of massive apparatus (from multinationals to stadiums). Classical audiences are more diverse, but not in terms of income levels. He believes a lot more work needs to be done concerning who gets to play and be played. But, like everything else in the arts, it is not for everyone. Alex has a reworking of Schoenberg’s quote ‘If it is art, it is not for all and if it is for all, it is not art’. His approach is more pragmatic: ‘If it is art, it’s not for all and if it is for all, it does not exist’. Tara Black reviews Cut it Out, a discussion about editing between Jane Parkin, Ashleigh Young and Fergus Barrowman. Images copyright Tara Black. Available now in selected bookshops nationwide. Sport is an annual publication that anthologises fiction, essays and poetry in one volume. The criteria for selection, with this volume as evidence, is a certain high standard of technical ability allied with a capacity for formal experimentation that doesn’t draw attention away from the progression of ideas and images. Sport 44 is populated with the work of writers ranging from high-profile (Manhire, Knox and Stead) to well-known in the field of literature (Wallace, Dukes and Tiso) to well-regarded in a variety of cultural contexts (Bollinger, Wilkins and O’Brien). Regardless of the names of the writers, the writing has one key element in common: quality. And the book itself has an aesthetic appeal, with its textured paper and austere cover design. It may not stretch things too far to suggest that just as Sport the publication provides a space for new writing, the physical object provides a series of spacious pages in which words, sentences and stanzas can float or declare themselves without fear of overcrowding. Has it always been thus, or has the digital era, with its emphasis on filling spaces with data or colour, highlighted through counterpoint this wondrous effect of black ink on white paper? Regardless of the answer to that question, the focus here is quite clearly the words and their cargo of ideas and symbol, emerging from the empty space. In Sport 44, there is valuable freight on every page, but there are several pieces that may especially catch the eye of the reader. Tusiata Avia’s poem I cannot write a poem about Gaza, in which the poet tells herself why she can’t write such a poem, is in her words ‘like a missile plotted on a computer screen’… that will… ‘enter the top of my head and implode me.’ By the time she comes to the end of her list of reasons (she will be called anti-Semitic, it’s too complicated for a non-PhD to talk about, she will upset her Israeli friends in Tel Aviv, her fury and grief will explode but this pales beside the fury and grief of her Palestinian friends), the hopelessness and seeming insolubility has entered the top of the reader’s head also. Breton Dukes, who has seen the light and moved to Dunedin, contributes an excerpt from a novel he is working on — Long White Cloud. This short piece, with its customary Dukes wit, astute characterisation, and analysis of the uneasy relationships that sometimes define New Zealand society, is a prompt to hunt down the novel once it is published. Dukes is a real talent, as is Craig Gamble, who also has a novel in progress; this excerpt, taken from The Society of the Air, is a shimmering molecule of fluid language. The essay section provides many excellent examples of how nonfiction writing can make effective use of the devices and principles often associated with fiction writing, such as disrupted chronology, reincorporation, metaphor and subjective revelation. The truth of the subject matter is made doubly resonant, and at the very, very least we learn something we might not have otherwise known. Nick Bollinger’s piece The Union Hall casts light on the genesis of his career-forming obsession with music and musicians; in the piece While you’re about it contemplate werewolves, the speculative and inclusive genius of Sara and Elizabeth Knox is revealed in a transcribed Skype conversation; and Emma Gilkison, in An Uncovered Heart, charts the repercussions of a diagnosis of ectopia cordis, a condition whereby the foetal heart grows outside the body. In her tender and painful essay, the writer probes the literal and figurative enigma of the human heart. In unison, the writers of Sport 44 aim at the head and heart. It is the best kind of writing, it is the best kind of book. Sport is something of an institution in the New Zealand literary-scape, having weathered funding storms and wrestled off naysayers. It has been a hothouse for emerging writers. Founded in 1988, more than 200 new writers have found a place in Sport, neighboured by heavyweights such as Bill Manhire, Vincent O’Sullivan, Emily Perkins and Eleanor Catton. 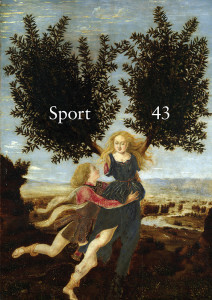 Apollo and Daphne, characters in a Greek tale of unrequited love, adorn the cover of Sport 43. Apollo obsesses over a nymph who, in an effort to evade him, transmogrifies into a tree. This is a story of changed form and immutable longing, foreshadowing Damien Wilkins’ essay that questions the necessity of personal change in storytelling. Sport 43 kicks off with an essay by John Summers, on the tribulations of student flatting. John plays at ‘real life’, and his efforts to shirk the ‘student ghetto’ lead him to meet some curious characters – including a landlady who may have sprung from a Dickens novel, a neighbour with ‘the strangest tattoo’ and a flatmate who accrues dogs. This is a delightful tale, which perhaps fits Wilkins’ brief of ‘no hugging, some learning’. ‘Out through the courts, through the posts, to where the field turns to tussock and storm bank and shoelessness and gulf’. Sport 43 includes works by over thirty poets including James Brown, Vincent O’Sullivan, Johanna Emeney, Anna Jackson, and Chris Price. ‘A jungle wrangles entire sections. This elegant collection, with sedulously chosen essays, fiction and poetry, demonstrates the strength of New Zealand’s current literary scene. Despite an absence of Creative New Zealand funding, the force is still strong. Available in selected bookstores now. Despite my trepidation (Sport 42 boasts a lot of poetry, and I am not a poet), I remembered that I can in fact recognize fine writing when I read it, and Sport 42 has a great deal of fine writing on display in this issue. In particular, the pieces of writing I responded to with the greatest enthusiasm were always the pieces where the style matched, supported and enhanced the content. Hence why Pip Adam’s story “Tragedy of the Commons” continues to ring in my mind; the story is disorienting to read, and there is a stone of despair in its belly, but this is the experience and point of view of Adam’s protagonist too, who looks out at a drenched Christchurch through dead, disoriented eyes. Lawrence Patchett’s taut writing was wonderful to read too—no fat, all muscle. I also greatly enjoyed the economy on display in both Breton Dukes’ and Uther Dean’s work. Dukes’ very short short stories were each only an A5 page long but nevertheless scooped together sharp characterisation, metaphor, dialogue, depth, plot and a character called Raimundo (and how can you go wrong with a character called that?) Uther Dean’s collection of haiku also managed to say a lot with a little, using the haiku form to perfectly (and often weirdly) present some of the grains of absurdity or sadness scattered through our lives: (“All the sad robots/Pretend to robot smile/At their robot friends.”) I also gravitated towards those pieces that seemed to open a door for us to drift out of real life and into dream or memory, as in Frances Samuel’s “Vending Machine”, and I also enjoyed Bill Manhire’s “Bridle Song”, which was zany as heck right up until it became very troubling (“pyong-yang-a-lang, pyong-yang-a-loo/dear leader says he’s coming soon for you”). Stephanie de Montalk’s ‘fact-ional’ interview with Alphonse Daudet (who died in 1897) was a highly absorbing piece of writing that also merged reality or fact with pure fiction, but which always felt truthful. de Montalk imagines going back in time to meet Daudet who suffered from the neurodegeneration typical of advanced venereal disease. She gives Daudet a voice, imagines his character based on his writing, imagines how he might sit, speak and act, while still incorporating facts and analysis and moving the interview through meditations on chronic pain and suffering. This was a truly masterful piece of writing, and it exemplifies why literary journals like Sport must continue to exist. I admit to some exasperation at the several pieces of writing made of well turned out words but little real feeling (as far as I could tell), but there was more than enough in this issue to show the importance of having this kind of outlet for creative writing. Long live Sport, and here’s to issue number 43!